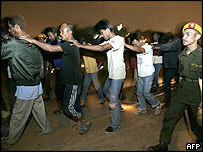 Malaysia has begun rounding up and arresting illegal migrants following the end of a four-month amnesty. Those arrested could face heavy fines, jail sentences and whipping. Police officers, immigration officials and volunteer reservists launched the round-up shortly after the deadline for foreigners to leave passed at midnight. The start of Operation Tegas was low key, with just a few hundred police and volunteers setting out from bases in the small hours of the morning. The squads visited building sites, plantations and restaurants - all popular work places for illegal migrants. One of their first stops was a construction site outside the capital where, according to reports, at least 40 foreigners were arrested having failed to produce proper documentation. Some illegal immigrants fled into the nearby forest in the dark, but returned to give themselves up, the French news agency AFP said. One of those arrested, Sumiyati, from the Indonesian province of South Sulawesi, cried as she told reporters: "I know what I have done is wrong. But I need the money to support my family. I will accept whatever comes. I place my life in the hands of Allah." The chief of a volunteer force which is at the head of the campaign to drive out the illegal workers, Mahadi Arshad, explained the procedure. "We will detain them for 14 days and check out their documents," he told Reuters news agency. "Then immigration authorities will decide whether to deport or to detain them." The government says it will deploy 25,000 frontline personnel with another 290,000 in reserve. Its immigration chief says there will be no safe havens and his officers will search towns, villages and even the jungle. Estimates of the number of illegal migrants in the country vary, but it is thought that more than half a million may have ignored an offer of help to return legally if they left during the amnesty. The deportation operation is sure to be closely scrutinised, not least by Indonesia and the Philippines, from where most of the migrants come. Indonesia's labour minister yesterday told a Malaysian news website that 100,000 of his country's citizens are refusing to leave Malaysia until they are given money owed them by their employers. Human rights groups have called on the government here to suspend deportations, saying that it fails to tackle the root causes of the problem - the willingness of many Malaysian employers to break the law and take on foreign staff without work permits.